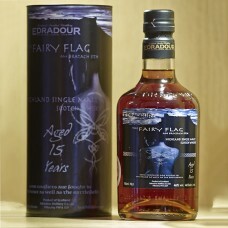 A special Single Malt named after the Scottish feature film, “The Fairy Flag”. The Fairy Flag recounts the epic romance between the Clan Chief of the Macleod’s and the mysterious Fairy maiden, Titania. This feature film by Rory Mhor Nicoll and Peter Columbia brings the legend to life. Following initial maturation in ex Bourbon casks for 8 years, this whisky has been matured for a further 7 years in fresh Oloroso Sherry casks. Mahogany in colour, this Single Malt is characterized by rich fruits, chocolate and a robust long warming finish. Nose: Dried fruits like raisins and plums, vanilla. Palate: Delicious rich Christmas cake with caramel and chocolate. Typical mouth feel coming from the old copper farm stills. Finish: Sweet and spicy, lingering and warming.